The Farm Fresh directory is a terrific resource for Mesa County residents to find farmer’s markets and roadside produce stands. This is a perfect guide for a day-date drive around the countryside to support local farmers. If you’re looking to get outside and acquire specific details about how to spend your weekend camping, fishing, hunting, or exploring state parks, this guide would be perfect for you. Put on those super attractive, shapeless waders and head towards the lakes and rivers! This guide includes maps, licensing and fee information, fishing state records by weight, fish identification charts, and beginner tips for all those excited amateurs out there. Have you ever felt the peaceful joy of meandering through the forest, watching and identifying birds? I personally have not, but this guide seems like a great resource to help you start birding. This unique report explains the benefits of preserving historic places in beautiful Colorado. It discusses the benefits of preserving historic places, celebrating communities while facing ever-changing demographics, and laying the foundation to promote preservation success for the next 50 years. This report even breaks down current projects underway in specific geographic regions of the state. To view this information online, click here. 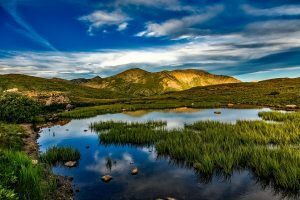 To further inspire outdoor wanderlust, the Colorado Parks and Wildlife Department offers these nature inspired videos available within Mesa County Libraries’ catalog for your viewing pleasure. Have a fantastic spring!